Universal switching power supply with option for mounting on a DIN rail. Nominal output voltage 24 VDC, nominal output current of 10 A, rated power 240 W, overload and overvoltage protection. List Price 139.00лв. VAT Incl. 131.99лв. VAT Incl. 125.00лв. VAT Incl. 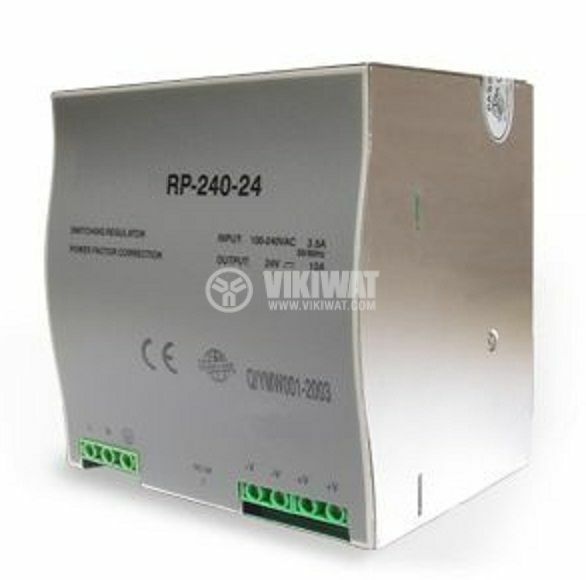 Model: VDR-240-24 Input voltage: 100-240 VАС Output voltage: 24 VDC Output current: 10 A Output power: 240 W Degree of protection: IP20 Body dimensions: 122 x 122 x 100 mm Mounting type: DIN rail Advantages: The power supply can be mounted on a DIN rail in distribution board of the building, which allows for a more elegant design solutions for your lighting. Работи на 8 ампера и се държи добре.